Ara Oshagan is a Los Angeles-based documentary photographer who delved into the world of the juvenile criminal justice to make “Juvies,” a moving series about the bleakness and despair of kids who are caught up in a broken system that has nothing to do with rehabilitation. The project was developed in tandem with filmmaker Leslie Neale, who created her own documentary on the subject. Oshagan graciously submitted to a long interview with us, and he has a lot of good insights on getting access, his process and the state of documentary photography today. 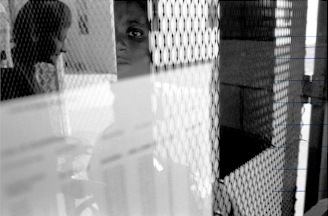 Leslie Neale’s documentary Juvies focuses on juvenile offenders in an LA County detention center. Can you tell us how you became the set photographer for the film? Leslie had seen some of my work from Armenia and she invited me to shoot with her. From very early on in the project, I did not consider myself to be a set photographer but in a sense a collaborator, a documentary photographer working in parallel with the aim of developing a parallel project, a book that would be about the same kids and same topic. For a project like “Juvies,” we’re always interested to know how the photographer was able get to permission to photograph such a difficult subject that involves state government and the prison system. It seems like you must have jump through a lot of hoops while cutting endless strands of red tape. Can you explain how you were able to gain access? Leslie Neale was a magician when it came to access. She was politically very well-connected in high places (for instance she knew the DA well), and she had some very key people in Corrections supporting her work. She also had an assistant who dealt with access on a continual basis. Often we would get shut down during a shoot and then we would have to wait in a waiting area until Leslie or her assistant made some calls and then we got clearance to shoot again. It was a HUGE and tireless effort on her part because, as you know, no one wants to give you access. I was supremely fortunate to be part of her crew. What was the routine like that you went through each time you entered the prison? We came with a cart-load of equipment—camera man’s equipment, sound person’s equipment, myself with my camera gear. A list of all our equipment would have to be sent in ahead of time and then at the entrance to the prison, our equipment would be checked against that list. Then we would be allowed in. Always one or two corrections officers would be with us the whole time we were there. Photographers are artists who are generally allowed to be creative and free-flowing, so was it at all challenging to photograph inside a place where there are many rules and restrictions? This was the most challenging part of the work for me. My usual process is to wander and photograph whatever interests me in, for instance, a certain region or around a topic. And I tend to spend a lot of time with people until they are comfortable with my camera and myself. To make the kind of images I am interested in, I need people to be in their natural way of life and ignore my presence. My book Father Land is based on this process. And I always work alone. So, in prison, not only are you not allowed to wander too far away from the two corrections officers who are accompanying you, but you also have to deal with a film crew shooting at the same time and basically shooting the same thing you are shooting. And when you are in the yard for instance, all the prisoners are interested in you and looking at you and want to speak to you. Plus to be able to shoot anyone besides the youths who were in the film, we needed to get signed releases. So, the whole process was very cumbersome and not at all intuitive. Did ever you feel as though your access was being limited, or that you were being censored regarding the people and things you could photograph? Due to Leslie’s magic, we went in as a documentary crew and were able to shoot in places very, very few people can—in the yard, in the dorms, in the eating areas, pretty much everywhere. But every once in a while we would get shut down as I wrote above. I personally was not censored on any specific occasion—like someone never told me “Do not photograph this.” But there were ground rules, which were: do not wander away from the officers who were accompanying us and no photos without releases. As long as we stuck to those rules, we were fine. If they felt you respected their ground rules, they respected us in doing our work. This was in the state prisons. 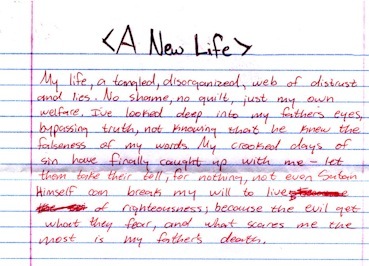 In juvenile hall, it was totally different story. The same respect was there, but you absolutely could not photograph anyone’s face besides the kids who were in the film. And there the corrections officers did not want to be photographed either. And in juvenile hall, we met the kids in the film in a “video production” classroom and rarely went anywhere else. When we did go to shoot their “dorms,” for instance, it was just us and our kids, no others. What about the guards and the people running the prison? How did they react to you and your camera? Did you ever feel as though that they did not want you there? There was a mixed reaction from guards. In the woman’s prison, for instance, they were much more relaxed and allowed us to photograph rather freely. In the men’s prisons, especially at Tehachapi, for instance, level 4 security, they were a little more on guard. But they helped our process on the most part. And almost all of them were fine being photographed and signed releases. And what about the prisoners? Were they open to you being there—in these incredibly intimate situations, too—or was it a process? Were there points when the kids were uncooperative or resistant? How did you handle that? In juvenile hall, we had no access to other incarcerated kids and the kids in our film were totally on board, so we did not have an issue with that. There were a couple of kids who had originally wanted to be in the film, but then dropped out, for whatever reason. We had a football star who was an integral part of the film then opted out. It is an incredible amount of honesty and bravery in these kids to be part of a film like this. Most people want to forget the days they spend incarcerated and move on as fast as possible. But a film creates a permanent record of your incarcerated life, there for everyone to see. So, it takes a tremendous amount of guts to take part in such a process, to reveal your life and be honest. In state prisons, everyone wants to be photographed and tell their story—the adults and youth. But there is a very strict code, a pecking order about who can and who can’t talk among the incarcerated themselves. Though often in the yard, I had freedom to go up to pretty much anyone, as long as they were not too far away, to ask them to be photographed. Rarely was I refused. But rarely also did I have enough time to spend with them. Many photographers get burnt out and simply stop after working on a project for a long period of time. Did you ever experience feelings like that? On the contrary. I feel I could photograph on this project for much longer and we did return a couple of times to state prisons on my request. The longer you work on a project the more depth your photos can have and that is critical. But at some point in time, resources begin to run low and you need to move on. When Leslie thought she had enough to finish her documentary, we pretty much had to stop. On the other hand, there are many other photographers who feel as though they can’t stop photographing their subjects—almost like it’s an addiction to their cameras and the environment and the people they’re photographing. Is this something you can relate to, or does this sound strange? That addiction is part and parcel of being a documentary photographer, for me. It is about having that deep connectedness to a subject matter and the people you are photographing. If that connection is not there, that obsessive nature, then you will only skim the surface. Depth requires addiction. Documentary photographers often experience the entire spectrum of emotions while working on long-term projects. Can you describe some of the emotions you experienced while photographing these kids? There is a point in every long-term project where I feel total and utter despair—that is, I feel my photographs are wholly and absolutely insufficient to the subject matter, that they will in no way be good enough, that this visual translation of what I am seeing in front of me and what I am feeling is a total failure—an “epic fail,” as my 11-year-old would say. I will always face the “What the hell am I doing here” moment. With my book in Armenia, it was the moment when, after shooting all day, I would come back to my room, and I would miss my life and my family, and I would have no idea whether or not I am making good photographs and I would simply despair. With “Juvies,” it was a bit ongoing, in terms of the high intensity of the situations I was in, and all the issues I had to deal with (wrote about that above: the lack of time, lack of space, etc.) and that I never knew if I was making good photographs. I never knew if I was connecting visually. But you just push through that and keep on photographing. I feel if you are connected in a deep way to the subject matter you are photographing, good photographs, photographs that translate that connection into a visual vocabulary, will shape themselves, will happen. You just have to believe in that, even though there are moments when that seems infinitely far. There are also moments that are elating, elevating. For me, these tend not to be photographic moments and I am not sure why. For instance, once I spent a whole hour speaking to a woman in a bus station in Armenia, she told me her whole life story, she was totally open and honest and forthcoming, to me, a total stranger. One whole hour we spoke and I snapped one photo at the very end. And I remember this woman for her story and her honesty, not for the photo I took of her. Some photographers express how hard it is for them to be away from their subjects—there’s a sense that they may miss something important. How difficult was it for you to be apart from these kids? And if so, were you ever discouraged by these feelings? There is a certain pragmatism, I guess, in my outlook. I knew I could not have access to these kids outside of the limited access that I had when I went in with Leslie’s film crew. So I did not worry about that. I made sure that I was totally ready—physically and mentally—when I did spend time with them, to make the absolute most of that time, to be fully in the “space” with them, to have a clear mind, to connect as much as possible, and hope that this connectivity will translate into good photographs. To make good photographs, I feel, one must create a good process. Photographs can never be an end; they necessarily must be a byproduct of an experience, a process. That connectivity with your subject matter must be present. If you go into a situation with the sole purpose of making “good photographs” you will invariably fail. Or at least, I will. But there is another aspect to your question. And it has to do with time and resources—two things that are ALWAYS in tight supply. And when I am working on other projects where access is not controlled by someone else, that question is always present—when can I photograph this subject again, when can I take time from my other work, my family and photograph…. This is always an issue because more time tends to produce better photos. So, one is always playing this balancing act, juggling act. One of the hardest things for documentary photographers is finding new stories and people to photograph. How do you go about finding new projects? It is very important that a documentary photographer connect in some significant way to the subject he/she is photographing. It has to come from the inside not from the head, that is, some kind of connectivity not a rationalization or a thought process that, I should do this project next for this or that reason. The thought process is there, but it has to first come from the inside. Most of my projects are related to my own life and reflect much about me. For instance, I just started a project in Arvin, Calif., documenting life in an agricultural town, an extension of my work in Armenia that has to do my own roots, the land there. Now I am looking at land here, in California. I also just started a follow-on project to “Juvies.” I am photographing at-risk youth—portraits this time with their collaboration. You were quoted as saying, “Do we know who these young people are and what we are doing to them?” By photographing these kids and sharing their stories with the rest of us, do you feel like you’re memorializing their existence? In other words, without seeing the photos of “Juvies,” nobody would know these people exist. Photographs in a sense memorialize everything. Every photograph by anyone memorializes a slice of our space-time continuum. Freezes it. I am doing this but also more. People know juvenile offenders exist, but they simply do not know how they exist, what their issues are, what they feel, the demons they struggle with. My work is about showing people these issues and making them realize, like I did very early on in this project, that these kids are not very different than you or I, that they are not that different from my own kids. Do you feel like your own personality influenced the project at all? The project has a very distinct viewpoint which is my own. It is totally influenced by me and my personality and worldview. It is not in any way objective. Which does not mean it does not speak a truth about these kids and their lives. It absolutely reveals important truths but through my own viewpoint. Can you describe what you sensed these kids felt, knowing that they were spending the rest of their lives in prison? The ones who are there for life, will at some point or another hit an absolute point of despair. But typically they will rise out of that and simply go on living. Because the alternative, death, is not much of an option. They take it “one day a time” as many told me. Meaning, they do not think about the future because it is too horrible to consider. They only consider the one day and then the next, and then next…. Can you tell us about your work method? Are you a photographer who operates on instincts or careful planning? A combination. Some planning is necessary to get into a situation or into a place where you can make good pictures. But for me, the photograph must be made with instinct; it cannot be planned. What about rules regarding post-processing? For instance, do use Photoshop as little as possible or restrict yourself when it comes to cropping an image? Much depends on the project. “Juvies” and most of my long-term documentary work is done with no post-processing, no cropping. Because they are work about the moment, the interaction at that moment with a place and person and the photo is about that space between me and my subjects and so it must remain about that space without cropping or post-processing. They must remain as they were seen. In “Juvies” though I make diptychs and triptychs with my images, which changes the relationship between images but not their relationship to me. But on other projects, like I have a project about my own everyday life, called “This,” and there I crop images. I change their color if I feel it is necessary, because that project is not only about the moment but also a continuum, a continuous interaction of myself with the world. It is about me. In terms of composition, are you thinking about framing, or is that also instinctual? I do think about framing but when taking photos I need to short-circuit the thought process, to bring in the instinctual, the experiential rather than the cerebral. A lot of the series was shot through windows and glass. Why? Was that intentional? Yes, there are two reasons for that. First, incarceration, imprisonment, entrapment, are all reflected in these kind of images, where the kids are all behind something, held back by something. They also speak to the fact that we do not know much about these kids. So they are held back AND we are holding them at a distance and know nothing about them. They work like a two-way street. But I have to say these were not thought-out reasons before the images were made. I did not say “I feel these kids are trapped and I want to make photos that reflect that.” On the contrary, I simply wanted to make images that were significant and allowed my instincts to set up the kind of photos I wanted to make. Only later, did it become clear to me what my experience was and what my instincts were telling me. When you entered the prison did you immediately visualize how it could be photographed? No, I had no clue. I just felt my way forward. Photographed whatever I thought was relevant and/or interesting, tried to “feel” as much as possible and let my camera be an extension of that emotion. After the photography was done, I visualized what my work was telling me about this place and these kids. What about any preconceived ideas before going in? Did they affect your judgment at all? The one major preconception was that these kids are truly violent in some way and that they are radically different than me. That pretty much collapsed to the floor on the first day I met them—they not only were not violent but, really, were not at all that different than myself or my own kids. Included in the project is your subjects’ own written words and poetry. Why did you choose to include this material and what do you think it adds to the work that couldn’t be achieved with only photos? By including their own words, it shares ownership of the image, it becomes a collaborative story-telling process. This is key to revealing who they are. I cannot come inside from the outside and effectively tell their very complex stories. They must take part in the telling. It also adds a whole new dimension to the work, a dimension which runs in parallel to the images, an “inside” image as opposed to what I do which is an “outside” image. You have degrees in Physics and English Literature from UCLA and a degree in Geophysics from UC Berkeley and have worked as a scientist. What made you switch to photography? And can you tell us about your first experience as photographer? I have always wanted to be writer. A novelist. I wrote for many years. And then, by chance, I picked up a camera because I wanted photos to accompany some of my writing. It came very naturally to me, to take photos, to talk to people, to photograph them. It somehow fit my character better, as a process. As opposed to the writing process which is really all about sitting and thinking. I started doing more and more photography and was making images I thought were decent. At some point, I realized that it is not the medium that matters, that is painting, music, writing or whatever, but what it is you need to say through the medium. Once I realized that I switched to photography. But I still have two or three novels bouncing around in my head which one day I will commit to paper. Were you always a documentary photographer, or did you start out shooting other genres? Who were your influences when you first started taking pictures, and how do you think they shaped you into becoming the photographer you are today? I was shaped by the tradition of black and white photography, the greats in the field. And wanted to take that form and push it to a new level, a personal level. Have your photographs or the film sparked any changes in your subjects’ lives? Leslie has worked hard to help Duc Ta get free. She has had some limited success in getting his parole date moved up, but he has not been released yet. Of all the photos that are a part of “Juvies,” which ones cling to you? I really do not have one image that stays with me. I see it as a series; the images only make sense when one follows another, when they are together. What’s been the reaction to “Juvies,” and what do you hope people see or understand by seeing your work? The reaction has been tremendously positive and moving. I think people begin to see how these kids are very similar to themselves and their own kids. After spending so much time with these kids and seeing firsthand how the juvenile penal system works, do you have more or less hope that things will change for the better in regards to long-term sentencing involving juveniles? I am not very hopeful that anything will change soon. Crime and therefore attitudes towards crime and so the juvenile justice system, go up and down with the economy. If the economy is good, people have work, crime tends to decrease and people are more relaxed about punishment. So, perhaps in a few years things will change a little. When the economy does get better, we need to be ready to implement some major changes. Many photographers tend to shoot a lot and have a difficult time editing their work. Can you estimate how many rolls of film you shot and describe what it was like editing “Juvies”? I shot around 5,000 or so photos for “Juvies.” Editing your own work is very hard and so I work with editors who help me along the way. I also a have a big board in my office where I put small prints of all my work and I look at them all the time. If a photo is truly good, then after I look it 50 times or 100 times, it should still interest me. If not, that photo comes off my wall and another goes up. It is a slow process, but it tends to weed out the weaker images well. Why work in black and white as opposed to shooting color for this project? All my long-term projects are in black and white. It is not a choice but a way of seeing. I see better in B&W rather than color. That is simply how my brain is wired. B&W tends to be more about form and structure and I somehow relate to that. What’s your outlook regarding the state of documentary photography? Documentary photography is alive and well. There are so many online magazines that publish work, it is crazy. And the number of grants available now is quite high but also quite competitive. The number of books are also on the rise. And the quality of work out there is amazing. Photojournalism, as we know it, no longer exists but documentary photography has changed little. Photographers still have to find their own funds to do long-term work, like any artist, any art form. No one will support you to do a project for 10 years. You just have to find the funds and do it. Do you feel like the work of a documentary photographer is fated for niche markets, or do you believe there’s still reason to be optimistic? I think documentary photography will slowly move into the art market—it already has. It will spread more and more in that direction. The evidence of popularity of reality shows speaks volumes for the public’s appetite for the “real document.” Documentary work will live in galleries, books and online. What advice do you have for documentary photographers, young and old, who are pursuing a career in photojournalism? Do you recommend school? Internships? Contests? Networking? I have no idea what the future of photojournalism is. Right now it is in a huge state of flux where the distribution system is changing, but the support structures are not in place yet. That is, it is going online and no one knows how to pay the photographers yet. As I wrote, documentary photography has not changed much. You still have to find a passion, the connectivity, then the funds and then get it out into the world. For anything you need networking—it’s absolute key. Contests are good also and the judges vary greatly so it is possible. Anyone starting out I would give the advice they always hear: take pictures, take pictures, take pictures. Look at your contemporaries and then ignore them. Find a topic/subject you are connected to and photograph it. It takes time to develop your own vision. I just started two projects. One with a farming community in the Central Valley of California. Looking at life and land there, a follow-on to my newly published book about people and land and identity in Armenia. Will this project be about identity? I don’t know. I have simply set these parameters for myself—photograph life in this small town in the central valley, Arvin, California. Language is somewhat of a barrier as 60 or 70 percent of the people there do not speak English. Knowledge of the language in Armenia was, I think, one of the thoroughways to identity. How will the opposite play out in my work? I don’t know. I will simply photograph and let the photos tell me what they are about once it is all said and done. I also started a follow-on to my “Juvies” project. I am working with at-risk youth outside the prison system, the ones on the periphery and at risk of falling into the system. Or at least troubled. I want to make portraits and I want to them to write their stories directly onto the photo and its borders. Many of these kids have mentors so the project will be a three-way collaboration between myself, the youth and a person guiding them in a sense. I also have three other books on the docks, to be published. The “Juvies” book is very important. I also have a project called “Traces of Identity” about my own Armenian community in LA, a self-reflective work that is very much about identity. Another one is a portrait project with my friend Levon Parian with survivors of the Armenian Genocide of 1915 and their stories. I also have a few smaller books I hope to finish up soon. I know the despair. I’ve been there… but never that deep in IT that I knew I wasn’t getting out… that’s the part none of us can understand except these kids. They have a name for the time they get… A YEAR AND A DARK DAY. Ara Oshagan is a Los Angeles-based documentary photographer who delved into the world of the juvenile criminal justice to make “Juvies,”a movingseries about thebleakness and despair of kids who are caught up in a broken system that has nothing to do with rehabilitation. some of these responses look like they are left by brain dead individuals? to sell their work online. If you wish for to get a good deal from this paragraph then you have to apply such methods to your won webpage. search engines by using prominent keywords and key phrases. leverage points. Customers have come to expect full color, so make sure to incorporate colors. reputation of each of the company’s they have selected. You will be picked up from your home, ushered to the limo, and driven to the restaurant or to the hotel where the party is. help make the process go much more smoothly. But this doesn’t mean that courier companies have stopped their services in such kinds of delivery services. to begin your search then Click Here. I clicked submit my comment didn’t appear. Grrrr… well I’m not writing all that over again. Anyways, just wanted to say fantastic blog! wet it is more elastic and vulnerable to breakage. few days, the results of the RFF take a bit of time to show fully though. heavily on Lewis, but he’ll increase the team’s depth and provide yet another scoring option on arguably the league’s most dangerous offensive team. wants. Comparatively harmless are people counter systems. famous blogger if yyou are not already. Cheers! Often we would get shut down during a shoot and then we would have to wait in a waiting area until Leslie or her assistant made some calls and then we got clearance to shoot again. It was a HUGE and tireless effort on her part because, as you know, no one wants to give you website design. places your cutsom link before the URL name, Not – Long. “@ – To point out a Tweep or respond to them immediately, be sure to comprise the ‘@’ image prior to their username. There are a lot of factor to learning how to sell well on Twitter and there is still a lot of research taking place to find the best methods.